This is one serious cookie. It’s certainly not for the faint of heart, weighing in at a whopping 4 ounces and loaded with chocolate. I certainly did not come up with these giant cookies on my own; they are a copycat recipe for one of Levain Bakery’s legendary 6 ounce cookies. Levain Bakery has a fabulous reputation and is hot spot in Manhattan serving up a variety of baked goods from rustic breads to their signature 6 ounce Chocolate Chip Walnut Cookies. 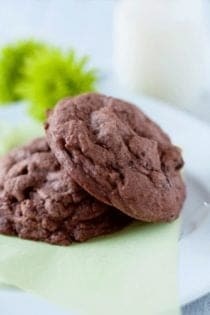 These cookies get a lot of buzz, if you don’t believe me, simply do a quick google search, you’ll be inundated with cookie chatter and many copycat attempts of their secret recipes. If you watch the Food Network, Levain Bakery has been featured on numerous shows such as The Best Thing I Ever Ate, Throwdown with Bobby Flay and Roker on the Road. If you want more info on Levain Bakery, check out their website and bask in all things delicious! A quick search for a Levain knock-off led me to Lisa’s blog, Parsley, Sage, Desserts and Line Drives. Lisa’s site is full of delicious food and baseball. Lisa’s recipe looked fantastic, so I headed into the kitchen and got my bake on! I decided to tweak Lisa’s recipein an attempt to construct Levain’s Chocolate Chocolate Chip Cookies. I have been slightly obsessed with this cookie since I first laid my eyes upon it’s ooey gooey center on a recent episode of, The Best Thing I Ever Ate. When Rocco Dispirito broke one of the babies is half… I was immediately smitten! I actually weighed out the cookie dough and ended up with 9 four ounce cookies. A scale definitely comes in handy, but you can totally eyeball it if you don’t have a scale. If your kitchen is lacking this essential tool, you should should check out the giveaway I am hosting for a brand spanking new EatSmart™ Precision Pro – Multifunction Digital Kitchen Scale. How do they taste? Well, I have never experienced the pleasure of eating an actual Levain Bakery cookie; however, this knock-off was pretty tasty. I must admit we enjoyed them much more the day they were baked as opposed to the days that followed. Lisa recommends tossing these in the microwave for 5-10 seconds to refresh them… I can attest to this trick! I think I will attempt to make Lisa’s Chocolate Chip Walnut Cookies next just sans the walnuts! Have a fabulous day and don’t forget to enter to win yourself a new scale!! 1. In bowl of electric mixer fitted with paddle, cream together butter and sugar until well blended and fluffy. Add eggs and beat until well-incorporated, then beat in cocoa powder. 2. Mix in flour, salt and baking powder until just combined. Gently fold in remaining ingredients. 3. Transfer dough to clean work surface and gently mix dough by hand to ensure even distribution of ingredients. 4. Bake in the preheated oven 16-20 minutes depending on how gooey and raw’ish you like the middles. I wanted the middles of my cookies to as ooey and gooey as the one I saw on The Best Thing I Ever Ate, so I baked these for 16 minutes. You can certainly increase the time to 18 minutes if you want a less raw cookie (this is Lisa's preference). 5. Let cool on a rack and store what you don’t immediately eat, in an airtight container. - To freshen them after a few days (if they last that long), give them a quick nuke in the microwave for 5-10 seconds. 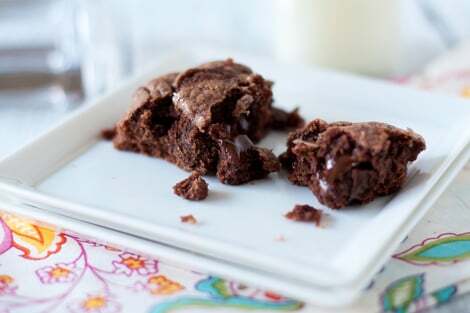 i love gooey cookies plus chocolate i will try these tonight. Amazing! I’ve never had a Levain Bakery Cookie, but I can imagine how wonderful these are. Four ounce cookies?!? These must try!!! These look and sound amazing! Especially that amazing gooey center….yummy!! Wow, that looks like a serious cookie. Levain cookies ARE AMAZING! Try them with peanut butter… you will die of happiness! I am so glad you posted this cookie and the bakery’s link. I saw these cookies on Throwdown a long time ago and have, since then, been on the search for a recipe that created a cookie like these. Needless to say, I haven’t found it yet, but now I know how to do a search for some copycats. Thanks! I will have to try your recipe. They look delicious! Made these tonight. 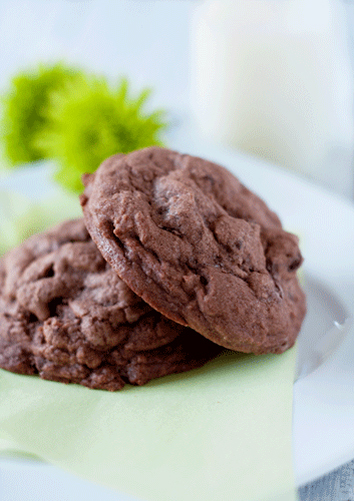 This is the ultimate chocolate cookie! Rich chocolaty goodness! How much does a normal cookie weigh?? This sounds awesome! That’s what I call a LEGIT chocolate chip cookie! These cookies look fantastic. I’ve never tried the Levain cookies, but I want these. Glad you reminded me and they look outrageous! These look so so good…I love secret copycat recipes…it’s like solving a puzzle. Good job!! I’m definitely trying this recipe. Those cookies look fabulous. Nothing like a big chocolate cookie with a gooey inside. Oh wow–these would be a fantastic mouthful of chocolate that’s for sure! I can’t wait to try this recipe. I love the Levain Bakery cookies. When in NYC a couple years ago I got a box of them to go, hand-carried them on a plane back to my family in Florida. It was a wonderful treat that everyone enjoyed. I’m headed to the Big Apple again this year and can’t wait to get another box of cookies. I love the big cookie recipes. I was inspired to post one of my own at http://itstartedinbulgaria.blogspot.com. I’ve enjoyed your site since a friend of mine in San Francisco recommended it as a good substitute for cookbooks while I’m here in Bulgaria. Smitten indeed! And very easy to make! I have a knock off of their choc chip cookies and it is fabulous, I cannot wait to try these ones. Thanks for sharing. Sooo…I made these yesterday, and everyone RAVED about them (though I mixed the remainder of 2 different cocoa powders I had, and had to use maybe 1/2-3/4 cup of what I believe was frying flour, but really could have been anything :X ). I’m excited to be WOW’ed by the real thing back in NY–or by comparing my excellent baking skills to the real deal, eh! Love your blog, especially the pictures…Keep it up! I just finished making these and I like them but I don’t love them. Im thinking of maybe adding some white chocolate chips in them. I also dipped them in sugar before I baked them. I made medium sized cookies and also had to flatten them down because they didn’t really spread for me. Again I think they are good but not great. It could just be me so I am waiting for my boyfriend to come and try them. I’ll have to let you know what he thinks. i was wondering, how long should you bake these for if you’re making smaller sized cookies? If your making smaller cookies, I would take a couple of minutes off of the baking time. I suggest just keeping a close eye on them and use your best judgement on the time. Thanks for stopping by and have a great day! Hi, these cookies touched my cookie weak spot!! would love to try them, but how much does two sticks of butter weigh in terms of cups or grams? Asah, 2 sticks of butter is approximately 227 grams according to google.